In visiting the ASSA ABLOY mobile showroom, you’ll quickly realize the astounding combination of technology and performance that goes into the company’s door opening solutions. With a specific emphasis on classroom settings, the showroom featured a real-life demonstration of its Safe Zone technology in a music room. The gist of Safe Zone is that the door will remain open as long as it detects motion, making it easier to carry large items in and out of rooms without wear-and-tear on the door. 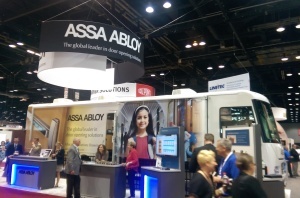 Furthermore, ASSA ABLOY doors demonstrated exceptional acoustical performance. In the on-site simulation, loud music was completely inaudible with a closed door. Now, that’s something to make some noise about.